If you are a beekeeper in the USA, please see below this open letter to American Beekeepers by beekeeper Tom Theobald, scientist Dr Henk Tennekes, and beekeeper Graham White. Please see below an Open Letter to American Beekeepers which we have put together after the debacle of the White House Task Force Report on Bee and Pollinator Health, which recommends no substantive action, on the causal role which pesticides have played in the mass-deaths of bee colonies and pollinators. We have taken this initiative very reluctantly, in response to the deafening silence on the part of the major beekeeping organisations, in contrast to widespread condemnation of the report by leading environmental NGOs. The central criticism is that the White House Task Force has completely ignored the central role which pesticides have played in the death of over 10 million American bee colonies since 2003. Current annual colony losses are running at 40% plus, which is unsustainable. Some beekeepers have lost up to 90% of their colonies and many have gone out of business. Despite millions of dollars being spent by EPA, the USDA and the US Govt, little real progress has been made on this catastrophic extermination of bees and wildlife since 2003; because any focus on pesticides remains officially taboo. The letter is appended below in three formats for distribution to your members and is also included within the text of this email. We would be grateful if you would share this with the widest possible readership, even if you do not endorse the sentiments; it deserves wide debate, whether you are ‘for’ or ‘against’ the spirit of the message. If you can place the document on your website, please do so. There is no need to respond to us personally in respect of this, (unless you wish to), but please make your views forcefully known to the national beekeeping organisations, the EPA, the USDA, your Congressional representatives and the press and media. Failure to act will be taken as ‘consent’ by the pesticide lobbyists and the EPA, who have successfully hijacked the White House Task Force to produce this ‘White House Whitewash’ on bees and pesticides. Dr Henk Tennekes, Consultant Toxicologist, Netherlands. The Presidential Task Force Report on Bee and Pollinator Health has been widely condemned for failing to address the primary cause of bee-deaths in America: pesticides. Environmental NGO’s have strongly criticised the Task Force Report including: PANNA, Beyond Pesticides, Center for Food Safety, Friends of the Earth, National Resources Defense Council and EcoWatch [please read articles in footnote 1]. The central criticism is that this report gives pesticides a free pass in relation to bee colony deaths. 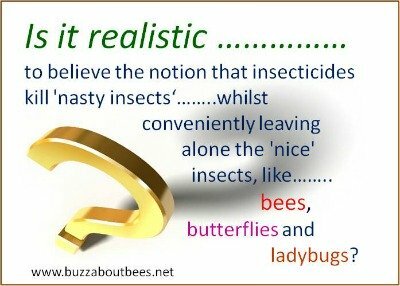 It is largely ‘Greenwash’ to cover up the issue of mass bee deaths and delay action; a nice piece of window dressing designed to give the illusion that ‘something is being done’, when in truth, nothing substantial is being done at all. In contrast to the reaction of the NGOs, there has been a deafening silence from the national beekeeping organisations; this suggests their complete submission to the corporations which set up and dominated the Task Force: Bayer, Syngenta and Monsanto. Independent scientists overwhelmingly blame just one factor for millions of bee colony deaths: the prophylactic use of neonicotinoid seed-dressings, (along with fungicides, herbicides and growth regulators), on over 200 million acres of American crops. There is no doubt that the primary objective of those who ran this Task Force, was to defend the market freedom and profitability of their pesticides at all costs. In order to justify this corporate greed, they rejected a mountain of scientific evidence (more than 800 peer-reviewed papers), which confirm neonicotinoids as the primary factor in global bee decline. They also dismissed the eye-witness accounts of some of America’s most eminent beekeepers, who ascribe the loss of thousands of their colonies, to the lethal cocktail of pesticides which saturates the farming landscape. 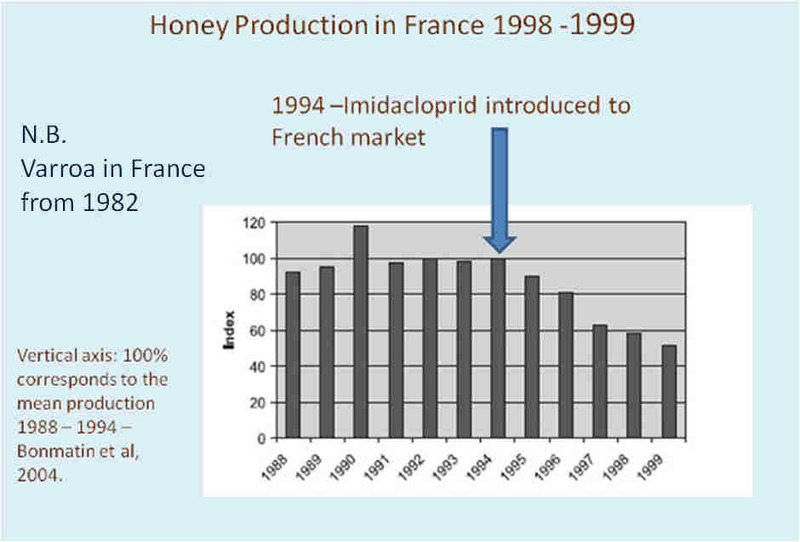 Preserve the market dominance of neonicotinoids and their 2.4 billion dollar annual profits. However, if the pesticide interests were to successfully hijack the Pollinator Task Force, they had to co-opt, or coerce American beekeepers, into signing-off on their ‘pesticide-protection agenda’. If the beekeepers refused to sign, the whole ‘pollinator protection illusion’ would collapse like a house of cards. The pesticide companies could only succeed by gagging the beekeepers with their own report. It is not known how they manipulated the beekeepers into this self-censorship; but the fact that it was done, is plain to see. The beekeepers representatives agreed to ignore the central role of pesticides in bee colony deaths. Attention was diverted to peripheral issues, like varroa mites and lack of wild flowers; but pesticides barely got a mention. The only ‘action’ the Task Force agreed to take on pesticides was to have“better messaging”; a meaningless phrase from the corporate playbook. Any proposal for stricter regulation of pesticides was taboo; any idea that the EPA might copy the European restriction on neonicotinoids was simply laughable. The EPA made vague promises about ‘re-assessment’ of neonics, in a couple of years; but any immediate action was simply out of the question. “Business as usual” was the corporate objective; “carry on poisoning” was the slogan. Diversionary and delaying tactics were adopted: ‘plant more flowers’ and fund even more ‘diversionary research’ into the alleged ‘mystery’ of millions of dead bee colonies. Faced with the apparent terminal decline of American beekeeping, with 30-40% losses annually, the Presidential Task Force offered nothing but a band-aid, and some flowers for the funeral. Why would beekeepers co-operate in their own destruction? Unless the beekeepers who signed this agenda were fast asleep during the discussions, they must have realised they were gifting the EPA and the pesticide companies ‘free license’ to carpet-bomb America with billions of pounds more pesticides, for decades to come. They ignored the European Union’s 2013 ban of the major neonicotinoids; along with hundreds of peer-reviewed Science studies, on which that ban was based. They swallowed the EPA’s ‘Big Lie’: that 200 million acres of neonicotinoid treated crops do not even qualify as ‘pesticide use’ and are not even mentioned in the pesticide statistics. They bought the official story of ‘multifactorial causes’, which ascribes bee deaths to: varroa mites, viruses, fungal and bacterial diseases. These factors all contribute of course; but the single factor which opens the door to the invasion of these pathogens, is the crippling of the bees’ immune system by neonicotinoids. ‘Multifactorial cause of bee deaths’, is just another industry-generated smokescreen to hide ‘the elephant in the room’; pesticides! They agreed to unrestricted use of the currently licensed neonicotinoids. They agreed to fund USDA scientists to carry out even more ‘diversionary research’ on the same dead-end topics, which have yielded zero improvement in the last 15 years. Why have the American Beekeeping Federation and the American Honey Producers Association agreed to ignore the truth: that neonicotinoids and other pesticides are the primary cause of mass bee deaths? Why did they fail to raise any objection, when the Task Force declared that any discussion of the link between neonicotinoids and bee-deaths was simply ‘taboo’? Did they not understand what was at stake here? Were they too naive or too timid, to object? Were they persuaded, or simply coerced, into betraying their own members interests? These questions are largely academic; when they signed-off on this report, they surrendered the future of American Beekeeping into the tender care of: the EPA, the Pesticide Corporations and Croplife. American beekeeping stands at a crossroads: one road leads to a pesticide-drenched future, mapped out in this Task Force Report. If the beekeepers swallow this without a fight, they condemn themselves and their industry to an increasingly toxic decline, ruled over by the pesticide companies and the ethically corrupt EPA. The alternative road is the path of public and political resistance. It is true that this would involve many battles, but this is the only possible route that could lead to a healthy future for American beekeeping. If beekeepers choose to resist, they would receive the support of millions of ordinary Americans, who understand what is at stake. The choice is simple: campaign now for bee-friendly farming and a pesticide-free environment, or carry on trying to pollinate crops in a pesticide-drenched landscape that is utterly toxic to bees. A Toxic Future for Beekeeping? Accelerating decline of American wildlife: bees, butterflies, soil-organisms and birds. Moreover, the Pesticide Driven Agenda, at the heart of this Report, will be seen by the public as the ‘agreed agenda of American Beekeeping’. As a result, beekeepers will find it even harder to raise objection to any use of new systemic pesticides. They will be forced to accept the dictates of the EPA and the pesticide companies; absorb the financial loss of 30 to 40% of your colonies each year, or leave the business. They may be forced to publicly oppose the environmental NGOs, who will undoubtedly continue to campaign for a ban on neonicotinoids. Beekeepers will have no choice but to ‘defend’ this ‘pesticide-driven agenda’ as their own, whenever neonicotinoids are debated in the media. We framed this letter in the hope of getting beekeepers to reconsider their involvement in this Task Force Report, and to foster debate on a new strategy. The current strategy of ABF and AHPA seems to consist of unconditional surrender to the EPA and the pesticide companies. It is vital that American beekeepers reject this Task Force Report and the ‘pesticide protection agenda’ which their representatives have inexplicably signed-up to. Please speak out now! Take action yourselves. If beekeepers fail to reject this Report, their silence will be taken as ‘consent’ to the pesticide-driven agenda at its heart. Contact the leadership of your beekeeping organisations: local, regional and national. Contact the EPA and USDA; let them know how you feel about the ‘Greenwash’ served up in this report. Contact your Congressional representative regarding this ‘White House Whitewash’ on bee and pollinator deaths. This is the last chance to demand real reform of the pesticide based agriculture, that the EPA, the USDA and the pesticide companies have imposed on the American landscape and on American beekeeping.